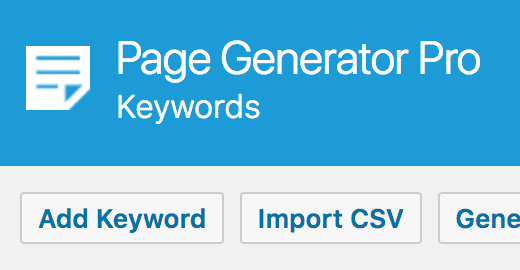 If you already have a CSV file, comprising of multiple Keywords and their Terms, Page Generator Pro provides an Import CSV function. This allows you to mass import multiple keywords and terms from a single CSV file, without needing to manually add them individually through the Keywords form. 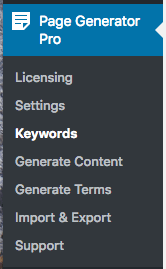 To access your Keywords, click on the Page Generator Pro menu entry in the WordPress Administration interface, and then click on Keywords. Looking to import terms into a single keyword, and use a delimiter and column names instead? Refer to the Keywords Documentation. CSV File: Choose the CSV file on your computer to upload. When you’re finished, click the Import button. A notification will be displayed confirming the number of Keywords that were imported successfully. If you try to import a keyword that already exists, you’ll receive a warning telling you that the keyword has already been specified. None of the CSV file’s contents will be imported.